Oativa is an exciting new flexible ingredient in the UK which is suitable for vegans and is available in 5 flavours! I was sent my log of Mediterranean Oativa as I’m doing some recipe taste tests for them. The one thing I had to promise was to be honest in my feedback, which of coaurse I was very happy about. I was really pleased when the package arrived. It’s made of only natural ingredients (there’s nothing at all there that you’d need to look up! ), is ready to eat from the packet, but can be cooked and can be frozen. The log shape also makes it totally flexible for slicing, dicing or cubing. So far so good, but how did it actually taste? 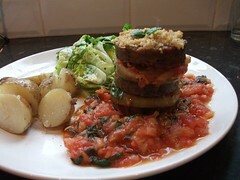 The first recipe I tried was an Oativa and aubergine stack. This required slices of Oativa so I took advantage and had a nibble of the edge which I cut off to make nice neat slices. Yum. Nice flavour of sun dried tomatoes and herbs. The recipe was very tasty too, served with a fresh tomato and basil sauce. The Oativa didn’t dominate as I’d feared and it was a very nice dish indeed. I still had plenty left, so I decided to try a sandwich with it. 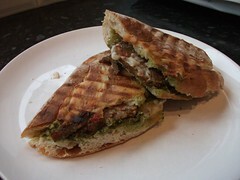 I spread ciabatta with home made pesto, slices of Oativa and some Cheezly mozzarella, and put them in my panini maker. This was really good – quick, simple and sooo tasty! I’ve still got some left (after 1 main meal and 2 very hearty sandwiches) so I’m thinking I might try the rest in a pasta dish. I would guess that you could easily get 3 different meals for 2 people out of one log, depending of course on what you make. So as you can see, it really is a versatile product but it tastes fabulous too. I can’t wait to try some of the other flavours. I think we’re recipe testing mushroom next, so keep an eye out here to see how that one is. 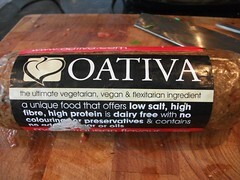 I’m told Oativa is starting to be available in health shops, so do ask for it, and hopefully it’ll manage to break throught the hideous Quorn stranglehold on supermarkets. A really excellent addition to the vegan kitchen. This entry was posted in Product review by efcliz. Bookmark the permalink. Ooh, I’d never heard of that (which makes sense, since it’s new). Cool! I especially like that first dish you made with it, it looks so pretty and fancy. I wonder if this product will ever become available here… I’d like to give it a try. The Oativa Team send greetings. If you would like to find out further details about Oativa please visit our website http://www.oativa.com. You can also drop us a line at info@oativa.com or sales@oativa.com. Is it similar to seitan? BTW I love stacked food! Yum, this Oativa looks like a great protein alternative. I checked their site and it seems the only place you can get it an online health food store. I hope it comes to grocery stores soon so I can try it! I am very intrigued by this! Hopefully it makes its way over here.